Eggs and veggies are always a good bet. I’ve usually got leeks and some kind of colorful veggies, but whatever you’ve got, just saute the veggies, add an egg and viola-dinner. Here’s my plan for what my mother calls “Jambote” or everything and an egg in the pan. Mom used to add potatoes to the mix, but I find that much too filling. But go ahead and try it, I loved it when I was a kid. It was Sunday morning breakfast-leftovers, potatoes and eggs. I made one the other day with leeks and yellow squash. It was wonderful. This time, it is much more colorful and makes a better photo-op. 3. 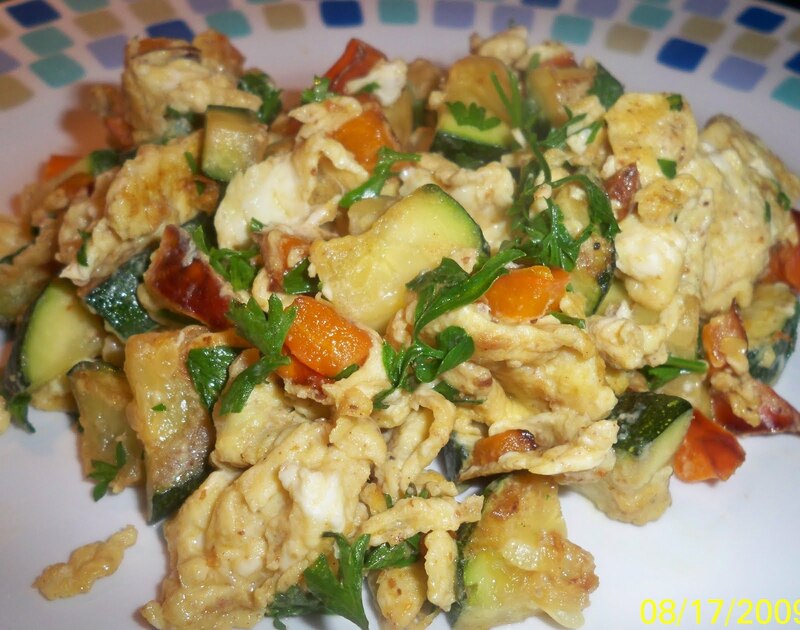 Add egg to veggies when they begin to soften. 4. Add parsley close to the end of cooking. 4. Cook until your desired doneness. I like mine pretty well-done. This is quick, easy and very tasty. It’s filling, full of veggies and provides a bit of protein. 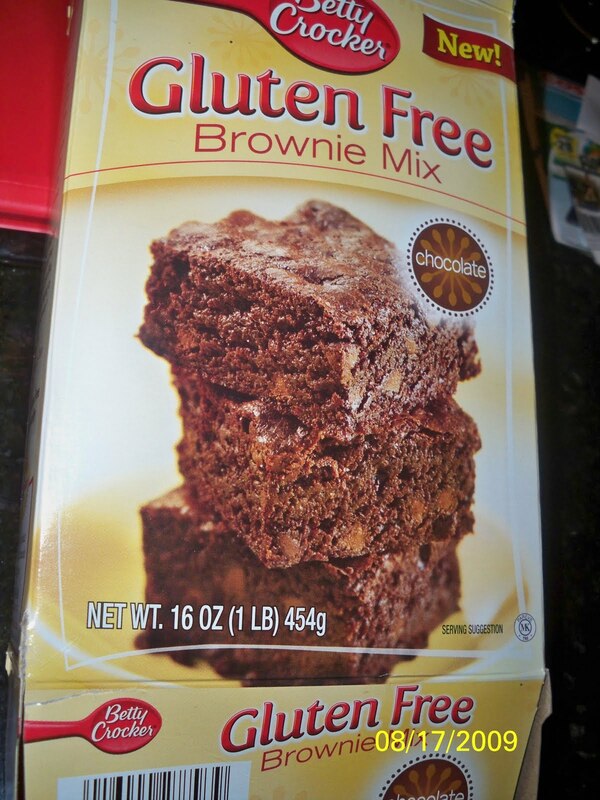 While shopping in Safeway tonight, I came across the new Betty Crocker Gluten Free Brownie mix. I thought it sounded wonderful and since I’m coming off of 2 weeks without sugar, what could be better? The box calls for 2 eggs and 1/4 cup of melted butter. To keep as dairy free as possible, I substituted 1/4 cup of grapeseed/coconut oil instead (I did add the two eggs). 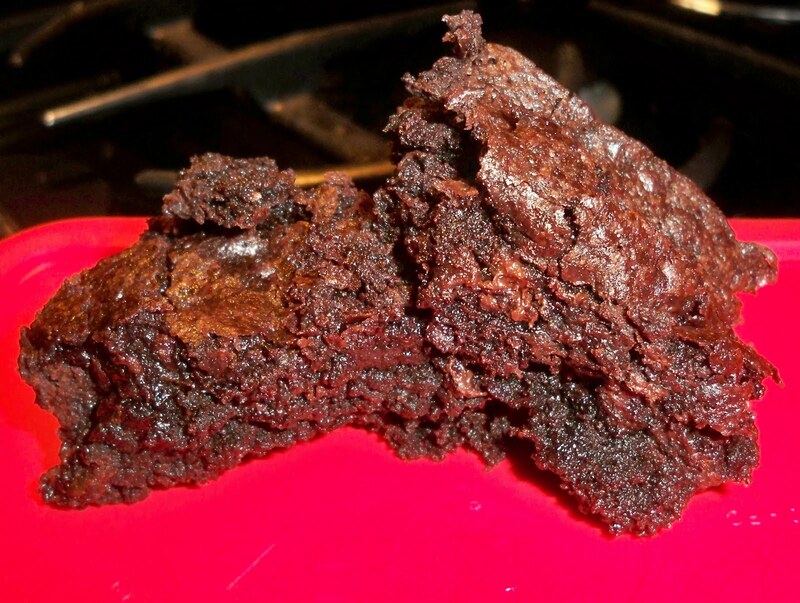 It didn’t seem to make a difference in the brownie itself and the taste was wonderful. Daughter at three pieces and didn’t want to eat dinner. My husband, who usually avoids anything gluten free or vegetarian, ate two brownies and wanted more. These are gooey, chewy, chocolaty and sweet. The mix even has chocolate chips in it, which makes the brownie even more chocolaty and yummy. It is so gooey when warm, daughter suggested putting vanilla ice cream on it. Sounded great except we didn’t have any, which was a good thing considering I’m trying to leave out dairy right now. If you see this in the store, give it a try. They are crunchy on the edges, chewy on the inside and very chocolaty. I don’t think most people could tell the difference. Golden Beets at the Los Osos Farmers’ Market. Aren’t they beautiful? I’ve got beet fever! A month ago I visited a good friend in San Luis Obispo. 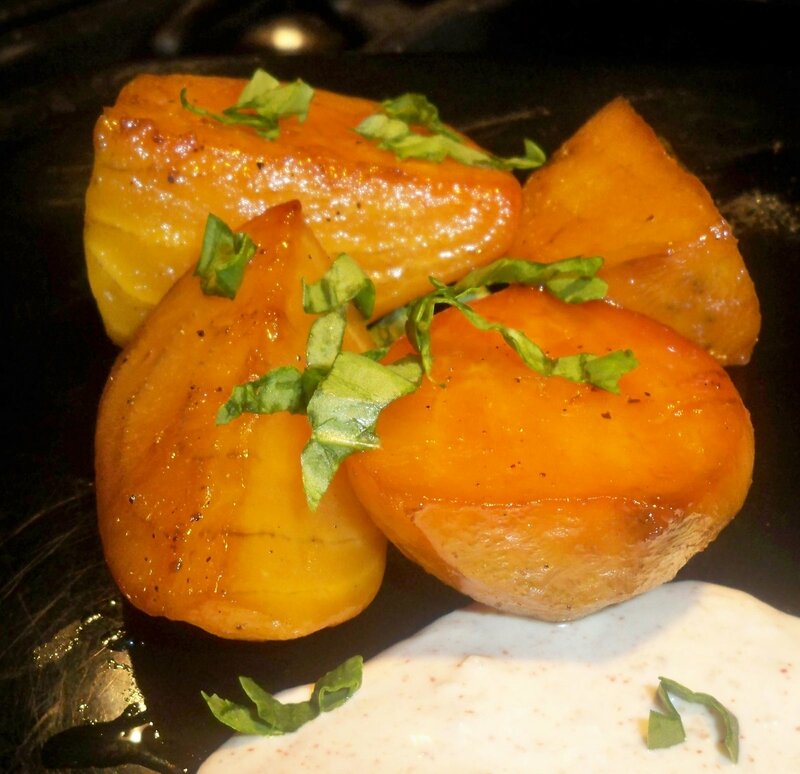 I was never a big beet lover, but when we bought some golden beets at the local farmers market and she cooked them up, I was a convert-big time. They were tender, sweet and so very tasty. I was hooked. Flash forward to my return to Phoenix. 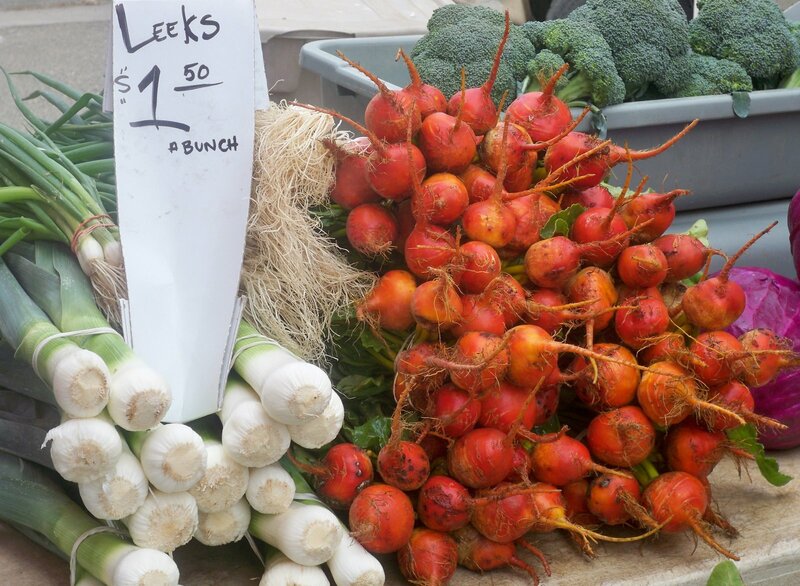 Not the mecca of fresh vegetables in summer that San Luis is…I searched for golden beets. Just the other day-Paydirt! Our local Wholefoods had a beautiful selection and I dug in. My recipe for roasted beets is partially from an old cookbook on roasting veggies, and partially from what I had in the fridge and I’m not allergic to. It’s that simple. But these were so wonderful, carmelized and yummy, it took every inch of self control not to eat them all in one sitting. 2. Peel and quarter beets and place in a large foil square. 3. Mix olive oil, agave and salt/pepper. Pour over beets and mix to cover all. Wrap foil loosely around beets. 4. Place in oven and bake for 1 hour. 5. Test to see if the fork goes in easily. I opened the foil and baked for another 30 minutes to get a beautiful golden carmelization. I’m always surprised at how long beets take to cook. 6. For dip, just mix veganaise, horseradish and cayenne. Serve as a dip with the beets. These are so sweet and satisfying. And on top of that, they are so good for you. If you can’t find golden beets, by all means use the red ones. Just be careful peeling them since they may stain your hands more than the golden beets. But it’s certainly worth it.